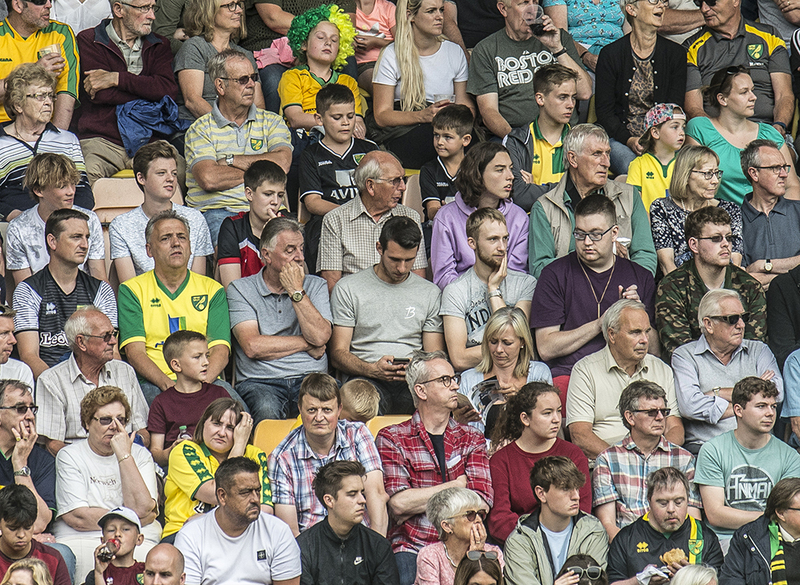 At the moment things at Carrow Road are far from rosy and there is an awful lot of moaning (more so than even the average Norwich fan can normally muster). But I can understand why. I can also see through the negativity brought about by our present position in the league and read into the ethos and ideology of Daniel Farke and Stewart Webber. I still believe that if we give this squad time to gel and allow our key, injured players to come back we can still come good. I am willing to be patient in the hope that we will turn our present form around. I get that five months is not long enough to see a mountainous climb through the wholesale changes that have been made. That is my opinion. We needed changes to rectify mistakes made in the past, but we can’t make these radical changes and expect things to get miraculously better. It needs time to be allowed to work. If by this time next year there is no obvious move forward then I’ll be asking more questions but, for now, I’m on board and I’m supporting my team. And talking of supporting the team, there’s been a conscious effort from some fans to improve the atmosphere, mainly in the lower Barclay,in an effort to raise the roof and make Carrow Road a fortress. Barclay End Norwich and Along Come Norwich have organised, with some success, flags, marches and meet ups; a recognition that we can raise the players game by our vociferous support and that it’s not only a one-way street. Daniel Farke has asked for us to vocally get behind the team, so it seems more than a little odd that while the chips are down, and there’s already an acknowledged issue in encouraging our loyal fan base to be loud and proud, the Club have started ejecting fans and sending out letters telling of the consequences to those who choose to remain standing rather than sitting. Three seasons ago my son and I moved from the River End. We wanted to join in, to stand and to sing where we thought it was more acceptable. We had sat opposite the Lower Barclay for seven seasons, and my son had often asked if we were able to join them. As an adult I decided to wait until I thought he was old enough to stand and be able to see the pitch. The Lower Barclay and Snake Pit are synonymous with ramping up the chanting and building pressure on the opposing team and away fans. The venom from the Pit towards an opponent taking a corner and E block aiming jocular verbals at the away fans are traits for which Carrow Road is renowned. So now, at an all-important time when we need the support and to lift the spirits on and off the pitch, when morale is as low as the entertainment level, when we need to be sticking together, we get one mean-spirited “fan” complaining about persistent standing! But not just complaining, also taking pictures of a child standing on a seat; bypassing the Club and heading straight to the local council! The Council and emergency services grant the club its general safety certificate each year and without this a certain number of fans could not attend games and it would lead to a cut in capacity. This led to the Safety Advisory Group (SAG) becoming involved and them stating that the persistent standing at the ground was unacceptable, and so the club have been told to make us sit or else reduce numbers in the lower Barclay starting from block A through to Block E.
The SAG have monitored home games and have deemed persistent standing to be a breach of the health and safety certificate, something that has backed Norwich City, as a football club, into a corner (one that has beaten the first man!). Unfortunately, it has ended in an own goal. They have to put actions in place and enforce the Lower Barclay to sit, thus doing the dirty work for SAG and leaving the Board open for criticism of something they have had literally no say in. Surely this must now highlight even more the need for safe standing. The argument that there will be less season tickets in the area loses its argument if persistent standing continues – capacity will be cut anyway. I, for one, would move my seat if the safe standing area was moved away from the Barclay as I simply prefer to stand at a game. And I can’t see why others wouldn’t be prepared to move to enhance their enjoyment of a game. Can one moronic (in my view) complaint be upheld in A Block where the fan has complained? Surely the 300 other supporters in that block can’t all be in the wrong? Surely they too should be heard? They choose mainly to stand, I’d argue that’s their prerogative. I agree it’s not safe for kids to stand on seats, however that boils down to the decision of the responsible adult. Yes, Norwich is an all-seater stadium but most stadiums in the top two divisions are, and when I visit other grounds I invariably notice areas of people standing. We are not alone but have been targeted because of one person’s viewpoint and their stubborn refusal to move when not happy with those around them. It also backs my debate (one that caused backlash) that if the Lower Barclay was the chosen area of safe standing it would be rejoiced by the majority and there would only be a minority moved. In my view this would lead to a harmonious result all round, with no pictures taken of children standing on seats by ONE person. A choir does not sit to sing. If you want an electric atmosphere let us stand proud and raise the roof. We are Norwich, this is our voice, we shall sing our anthem from Lower Barclay, Block A through to E.
Being one of the original choir of the Barclay Stand. we moved from the middle of the old South Stand . not the Main Stand or the Old River end Stand . see the idea . We always stood it was a 3 Stand sided . standing ground, if you wanted to sit you went in the Main stand got your little cushion ready to throw in disgust. at the performance or the Ref. It just shows to me that Football is no longer a game for the average man . cost aside do the club care about their followers, I doubt not. I had a run in with McNally , the first year they added the Academy extra payment. I suggested they would get more money if they had taken an opt in approach, rather than the opt out. He told me, I was disrespectful to the club. I then said that in that case I would not be renewing my ticket, he replied who cares , there is a queue waiting to take your seat. Now fans are told sit or get out .. Don’t know how the club could afford to have decreased numbers, what would the betting me seeing the rest of Carrow Road face increases. Did McNally really say that to,you? That’s disgusting. sadly he did, I didn’t renew that was the end of Hughton’s 1st season He also used the same term in an email to me. I kept it for a while but let the whole issue go. In that time I sent a copy of the mail to Delia , and never to this day got a reply. I have not set foot back in Carrow Road since that day my last game was a 2-1 win against Everton 2013. My first game was 1961/62 vs Bury . as a 9 yo. I go to the odd away game but that’s it as far as I am concerned . I love my football club but will not set foot in while this regime continues to waste money and make terrible decisions over and over again never learning . This is the obvious answer. However, until the law is changed we have an all-seater stadium and people should sit down. Why should I have to stand to watch a match because some people in front of me won’t sit down? Like other posters I am old enough to remember standing on the terraces and remember the lack of crowd control it brought. Conflating atmosphere and standing is a red herring. Exciting, attacking football will bring back the atmosphere. Max is not the only one. There are many near to me in Block B who would prefer to sit for the majority of the match, but who find it difficult, or painful, to stand for long periods, or are too short to be able to see. Everyone will get on their feet during an exciting period of play, but that’s not what this is about. Good piece Anita, the point you make referring to the atmosphere that would be generated is I feel a real one. My first season ticket in 1988 was standing in the lower river end. That section of the stand was filled with atmosphere then (unlike now) and the feeling of belonging was fantastic. Everyone knew each other and saved your space if you were late. It was a broad cross section of the support in there young and old. The banter and whit was tremendous which made up for any deficiencies on the pitch! I’ve thought about this seat/ no seat issue for sometime and I must say even though I’m not really blessed in the height department I’d go back to it tomorrow if I was allowed. The other thing I think it would also alleviate is the leaving before the final whistle issues we have at Carrow Road. If people had to leave early for whatever reason they could without affecting your view or inconvenience you when you stand to let them past, unlike the situation now!! I realise from a crowd control aspect it’s easier (and probably cheaper) to have everyone in seats, but standing gets rid of the self intitlement issue people seem to have developed within the all seater arrangements. Though I think it’s something which if it is to return will take a lot of effort to achieve unfortunately, no matter how valid the arguments put forward. Interesting to hear how it was before seated stadia was compulsory in the top two tiers. I also believe it generates a better atmosphere, let’s hope the governing laws can be looked at sooner rather than later. Being an older supporter I can remember sitting on the barriers in the south stand and adults holding on to you so you didn’t fall off. When city changed the south stand to all seats the atmosphere changed from a lound audible football ground to more like a theatre even early on you had a few people losing it when someone stood up wether to cheer a goal or moan at a decision against city. It is about time the FA and clubs band together and appealed the no standing and get it changed to safe standing in the Lower Barclay and possible River end, the upper tiers should remain all seating for safety. Anita, great article and I believe you are correct when you mentioned “one person’s viewpoint and their stubborn refusal to move when not happy with those around them”. No one should ever make policies based on the minority. The club should have politely reminded fans to stay seated and inform them that they are pushing for safe standing (preferably in the lower Barclay). I can’t help but think back to the consistent abuse at stewards in recent home games. The stance from the club is probably directly in relation to these moments. Those in the “Snake pit” who behaved this way toward the stewards should hang their heads in shame. In relation to atmosphere, it would be a good idea to bring back OTBC before every home game, including the words. In fact, I would love to see the club reintroduce the original OTBC to fans. It’s far better than the current rendition. At the moment, the atmosphere is stale before we even begin. OTBC gave the stadium a good kick. Singing is not the only option either. As a club, we should be looking into all alternatives. The flags are a great idea. I’m also a believer in using instruments. All the biggest clubs in Europe do. Simple things like yellow and green confetti or coloured cards on seats all add that little bit extra to the experience too. 100 per cent agree with the comments regarding On the Ball City. The way it is sung nowadays is pathetic. Didn’t these people’s fathers ever teach them the words? Daniel, what makes you so sure that the complainant’s view is in the minority? Well said Anita. I too have a level sympathy for the club on this one. Just who are this SAG? Would be nice to see or hear from them? Perhaps Archant could profile some of this faceless bunch of individuals? I also remain baffled as to what makes standing in these seated areas unsafe when a football match takes place but perfectly safe to stand, dance and drink alcohol when a concert (Take That for example) is taking place? After all it is the same piece of concrete one is standing on with the very same green seats in front and behind. Perhaps someone from the SAG could come forward and explain? Hope we all STAND together, loud and proud on Saturday! How true, however perhaps SAG are still of the archaic view that all footy fans are hooligans! From what you are saying Anita, it is my understanding that this individual has made his complaint to the council, having laid the club open to a potential part closure that would damage the club greatly and inconvenience many supporters into the bargain. I also read somewhere that he has refused to be reseated and as you state, took covert photographs of a child without anyone’s knowledge. The word “entitlement” is banded about far too much with regards to Norwich city’s affairs for my liking but if there was ever a case of that, this is it. Notwithstanding the the harm this idiot could potentially do,the club, the filming of a child has creepy undertones and connotations that anyone with a brain can recognise in this day and age. I sincerely hope that the supporters affected by this heavy handed letter do not choose to take on the authorities this week as this is truly a lose-lose scenario. Sad that with the level of discord surrounding the club at the moment, with good reason, that some jobsworth appears to have poked the bear with a sharp stick. Sometimes I despair. Agree with ALL your comments! Can you imagine if the Barclay crowd find out who the culprit is, It could turn nasty. However if Block A is closed where will this moaner go then? Cut his nose to spite! I bet he would be willing to move then. Yep pretty much agree with all of that Anita…. l don’t understand how legally this works though ? Every game I’ve been too the away support stands all the time, can the club really eject a home supporter/take their season ticket away or ban them when only a few yards away a large group of fans are standing in the same stadium. I’ve often seen stewards tell people to sit down only to quite rightly have it pointed out “what about them” in slightly more colourful terms obviously, the stewart normally shrugs his shoulders and hasn’t an answer. It’s not illegal to stand, however we are in breach of our ST rules, wether the club would enforce banning a fan, I would like to think not. However we live in a world where health & safety comes first, and not always common sense. My point was how can the club inforce rules on individuals in one block when clearly standing goes on all over particularly in the away section. The stewards and club can’t just pick on easy targets…..or can they…..what about if I complain I can’t see the revolving screen because because Sheffield Wed fans are standing? Will they make them sit down. ? I stopped reading at “this time next year.” After that, I can only assume it’s all equally as invalid and unworthy of my time. I would say sorry, but it’s your fault not mine. I stand / sit in Block A along with my 11 year son (who used to stand on his seat) and have been a keen observer of events this season; it has certainly piqued my interest more than events in the pitch..
To be fair the club their head of security responded to my complaints very openly in a telephone call. The club are being pushed into a corner apparently by one individual who has taken pictures of presumably my son and others standing and won’t let the matter drop despite the offer to be re-seated . I was told that the stewarding would return to a more appropriate level during the Preston game which it did and that the unpleasantness would cease . My son would n’t stand on his seat ,we would all sit for short periods during the game showing the law was being abided to in some sort of way and normality would resume.. I was very surprised to see the club up and the ante and stoke the fire again ; presumably the “complainant” was not satisified with the Club’s efforts ; I’m looking forward to how Saturday pans out.. I have however written to the Club again because I want to know what the issue really is and this is the nub of the whole issue. Is this threat safety driven or driven by a desire for those who want to sit to have an unobscured view.? If it is really Safety driven I have asked to see the Club’s Risk Assessment on Standing. I also know that the club have a duty of care towards my son but everyone is responsible for Health and Safety and he stood on his seat for over three seasons and at no point have I or he felt this to be unsafe, As previous correspondents have noted SAG need to come forward and explain the risks they are so concerned about. I’m glad you have taken the time to address this to the club itself, the faceless individuals of the SAG need to talk to fans in the area and come to a sensible decision, it’s not one rule for one and another further down the block. There are two issues here, which are being crossed over. The law currently states that stadia are all seaters and fans should sit for the majority of the match, apart from moments of excitement, and letting others out for comfort breaks / leaving early etc. The safety certificate if granted on that basis and the club has to be seen to be doing its utmost to apply the law. The issue of safe standing is a different question all together , we don’t currently have it in our leagues, it’s not available as a suitable alternative presently and is irrelevant to the sitting in block A rules. It’s a little more stark than that Andrew. To paraphrase your second and third paragraphs – “The law currently states that stadia are all seaters and fans should sit for the majority of the match. The penalty for the club not complying can be the loss of the safety certificate – closure of the ground – or loss of capacity – closure of a stand or part of a stand. There is currently an issue with the front section of Block A between the Snakepit and the gangway, not the other side of the gangway. Do we know whether anyone sitting between the gangway and Block B was sent the letter? My seat is in B close to the second gangway, looks like tomorrow might be as interesting off the pitch as on it. I don’t dispute the law. Norwich like most Club’s have to be over generous in their interpretation of it. “Letting others” in and out ; you could generously call this ten minutes at the start and end of a match and five minutes either side of half time. That’s half an hour. “moments of excitement ” ; forgive the irony give the poor fare served up this season but you could qualify this as any time we attack the opposition half and any time they attack our penalty box. A reasonably satisfactory status quo existed whereby a friendly enough steward would patrol the access walkways once or twice a game and we would sit thereby showing the club was acting within the spirit of the law. Yes it was a game./ a charade we were playing but it worked well for the support and the club. The steward in question has been quietly despatched to be replaced by the “heavies”. The club ,like the SAG and the Council, must see that standing in front of one’s designated seat , as per my original post, is not unsafe. Why the change in attitude ,why escalate the tension and the written threats. Surely the club don’t want to risk further deterioration ;the bond between the Barclay and the Club seems , from where I stand (sit), fairly stretched already. I don’t know what will happen Saturday ; I guess we will acquiesce the requests and the threats but I could also be the situation in the lower Barclay being more volatile and therefore unsafe. It’s not a case of if you agree with the law or not, it’s the law, and you cannot just disregard it as you don’t agree. Yes the club (and others) have possibly been relaxed in their enforcement in recent years, but they are over a barrel ATM, and have to at least be seen to be attempting to do something. No one has suggested that standing at your seat is dangerous, I would actually believe that this is safer than the terraces of old, with no chance of any surges etc. Safety certificates are given on the understanding that a framework will be adhered to, and if it isn’t the certificate is invalid/revoked. Also I’ve seen suggested that if parts of the ground are closed the club would have to relocate these people/ refund? Why? They would be in breach of their t&c of the ground regs and not entitled to anything. Although that only applies if they are proven offenders (CCTV evidence etc) . Andrew , don’t disagree at all. I have been complicit in the Club breaking the law and tomorrow to prevent dragonian ramifications I will do as instructed, I have every sympathy for their position. My only issue is the letter which stated “safety concerns” from “children standing on seat”. I would like these concerns explained . My son stood in his seat for three years, presumably monitored by CCTV, without any intervention from the club . Why did it need this unnamed individual (if he /she even exists ) to dossier photos of the children on the seats and tell the club it is unsafe?